1 WRC is a new vehicle or an older mule that was re registered. It's a hybrid SP/WRC vehicle with the SP body kit and the WRC engine. I see they also don't know what to call this car. Did it have 30 or 33mm restrictor? 1 WRC is going to be featured on a TV show. It has the 33mm restrictor as the mechanic said it had a WRC spec engine. It still has the SP body kit, and not the WRC one. 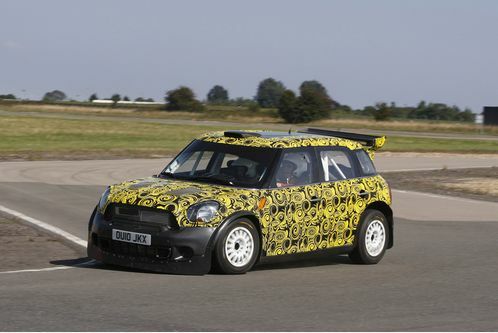 The final Mini WRC will be unveiled sometime this month. At the same time OU60 FRC is has been seen as WRC and a SP mule. Mini had a photoshoot of the SP version in Monte, but in a test not long after that shoot, it suddenly became a WRC mule. Click on Rally 2011 and there are a few new videos of the Mini JCW S2000 RRC in action, including an onboard from Rally Adriaco with Navarra driving. Well Mini is now considered a Manufacturer, thanks to an updated document that was put out by the FIA. There is another car 2 WRC. No. 37 is 1 WRC, while no. 52 is 2 WRC. 1 WRC has been a SP car, and a WRC. Prodrive must be proving that it is possible to convert a S2000 1.6T to a WRCar. Mini just unveiled their car in Oxford with Sordo and Meeke and it looks good. Hoping that high res photos will follow later. Meeke driving the Mini WRC in a gymkhana like track and having some fun for sure. HQ photos of the new Mini WRC. This is the most sporty firetruck I've ever seen. So, very interesting how good it'll be. This isn't the final livery as there aren't any major sponsors. Those sponsors will be revealed very soon. rv65 wrote: Well Mini is now considered a Manufacturer, thanks to an updated document that was put out by the FIA. Sorry, have to correct you here. Mini is the name of the team, as "FORD ABU DHABI" is a name for a team. This does not turn Abu Dhabi into an FIA acknowledged car manufacturer. According to the Mini's homologation documents manufacturer is still BMW. I agree, but the team can now score manufacturer points. Meeke mentioned of possible wins in the new Mini this year. In addition to Meeke and Sordo. Patrick Flodin, Armindo Araujo, and that slower than Wilslow guy from Brazil will all compete in the new Mini WRC. You could call that "The Italian Job"
ChrisB wrote: You could call that "The Italian Job"
Wow I guess it would make a nice rally car. The current London taxi is made by a Chinese owned company. Mini recently tested in Sardegna but on different roads. We'll see how well they do this weekend.